Awakening in Hackney on a sunny Sunday morning, the possibilities might seem endless - and mostly far too stressful. Nobody wants to venture into Central London on a Sunday tube timetable for that new exhibition (far too much time standing up) or fancy new bistro (uncomfortable shoes? On God’s day of REST?). Nah, best stay where you are, and have a browse of this helpful guide on how exactly to have a perfectly non-taxing Sunday taking in the best of North-East London. We’ll start our day at one of London’s only truly hidden gems, Springfield Park Café. 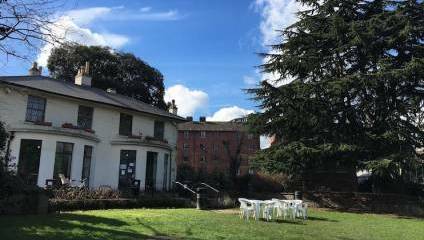 Set in the beautiful White Lodge Mansion, a Grade II listed building, this is, in my humble opinion, Hackney’s best garden café. It’s a must to sit outside: it’s mega relaxed, and gorgeous on a sunny day. Looking out over the rolling hills to the Lea below you genuinely feel like you’re in the middle of the countryside. We won’t tell you to get up too early, because this is supposed to be a lazy Sunday, but try to get there before 11, when it really starts getting popular. Simple British-mediterranean fare is offered – think a fry up, or fresh tomatoes, halloumi and olives on a bread bed. When you’ve had your fill of the food and the view, wander down the hill towards the canal to set off on your half an hour walk southwards with the Lea on one side and the wetlands on the other. Make sure to admire the local dogs – and cows - before carrying on through the park to the end of Chatsworth Road. This is where you’ll find the beloved (and still not yet irritatingly busy) Chatsworth Road Market. The market started in the 1930s and closed in 1990 for 20 years before reopening in 2010 close to the beginning of Clapton’s incredibly rapid period of gentrification. There you'll find a gamut of goodies, of which highlights include Chatsworth Flowers, the flower stall run by grandfather and granddaughter; handmade South African jewellery, textiles and toys from Ekhaya, and beautiful clothes from Nina Baker. You can grab a pick-me-up at Millfields Coffee, next to the entrance to the park, where most of Lower Clapton pass through for their flat whites. They just recently got their drinks license in, if you fancy getting the first beer of the day in early. If you decide to stick to the pastries, though, we’d recommend a cardamom bun – the lesser-worshipped but equally delectable sister of the cinnamon bun. Or, you can go straight to the source of the pastry at Charles Bread on Lower Clapton Road, where Monsieur Charles’ delights seem stack almost up to the ceiling. Then you’ll be on one of Hackney’s main arteries, and you can easily hop on a bus to your next destination, one of the best Sunday activities in all London – browsing Columbia Road Flower Market. By this time, the market will be winding down, and the midday rush, during which you are as likely to squash your flowers approximately 9.3 seconds after buying them as you are to spot your ex with their irritatingly hip Scandinavian-looking new partner, will be over. Now, gardening fanatics might insist on arriving when the market opens in order to get their green fingers on the biggest and best bulbs money can buy, but during the last hour of the market, between 2-3pm, you should be able to get some fabulous blooms at a bargain, as this is when the stall-owners will begin lowering their prices to make sure they sell all their stock. Laden with your sweet-smelling booty, then embark on a last 15-minute stroll, past Hackney City Farm (don’t forget to wave to the donkeys) to The Cat & Mutton, which resides at the end of Broadway Market. The market itself is open only on Saturdays, so you’ll be able to make it to the pub without any further distraction or assaults on your wallet. The Cat & Mutton is a warm and welcoming pub always filled with friendly faces sinking a pint or two with mates. Their roast is ever popular with its choice of trimmings: trad with all your usual suspects, or summer style with. Not only do they have a vegetarian option (mushroom, stilton and walnut wellington) but also a vegan option (tofu and sweet potato pie), leaving veggies with a stunning two options for a Sunday roast, which will be a first for many herbivores. The pub also has a few non-traditional small plates and mains available, from halloumi fries to pork belly bao buns, for anyone who strongly believes the day of the week shouldn’t control their menu choices. And there you have it: the perfect Sunday in Hackney. Now, all that's left to do is Netflix, nap and try not to think about Monday.